Give playtime a South American twist with this friendly llama plush toy. Llamas and babies may seem like opposites: one carries people on their back, the other is always the one en tote. But when it comes to being cute, often having wild tufts of hair, and spitting (or spitting up), they might as well be the same species. Meet your little one's new best buddy: a plush version of Peru's most notable pack animal. 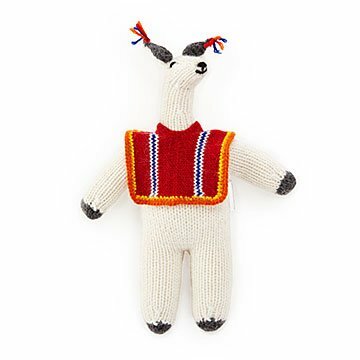 With a warm expression and an authentic poncho, this toy made from alpaca wool and polyester adds a little south of the border love to play time. Made in Peru.